Our first snow of the season and now I'm really missing the warm weather. What started as a dusting is now a white out outside my window. brrrr. 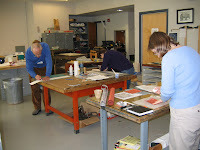 Here's a shot of my workshop students hard at work last month - which now seems so long ago as I can see the sunshine and leaves on the trees outside the window. Looks like my sketchbook class at the Corcoran College of Art and Design is on for spring semester and will be titled seven short sessions with the sketchbook. (I hope it makes it into the catalog this time) For those of you who signed up last fall - I thank you and hope that you'll give it another go in the spring. We're going to crank up the volume on this class and dive into the sketchbook from the inside and out, including the book form I submitted to the National Museum of Women in the Arts. Details to come. I'll also be offering a short workshop at the Donald W. Reynolds Center for American Art and Portraiture next Thursday December 13, 2007 at 3pm. 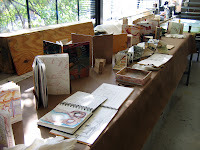 This class will take a brief look at their current sketchbook show and then get you moving in your own sketchbook. RSVP to AAAExhibits@si.edu if interested. I bet it won't be looking so sunny and green out the window that day... but we will be thinking warm winter thoughts.